Q: What is the cost to attend Camp? A: It is $150 for the first child and $110 for each additional child attending in the family. So, for example, a family has 3 children attending Camp Bird. The total cost in this example for all 3 children is $370 dollars (the first child is $150, and the other 2 children cost $110 each). Detailed information and registration forms can be found in the Registration section of the site. Q: How are you able to keep registration fees so low? A: Camp Bird is owned and operated by Marinette County and a very reasonable rent is charged for our use of the well-maintained facilities and private lake. Primarily, however, our rates are low because all of our dedicated staff members serve as volunteers. Q: Are your volunteers qualified? A: Our staff is highly qualified by both experience and training. We have been operating this summer camp since 1952. Many of our staff members are called workers from the teaching and preaching professions. Those of us that are not called workers are highly trained professionals from other walks of life, including medicine, law, Christian counseling, and law enforcement. Our nurses, head cooks, and lifeguards are all properly certified by the state of Wisconsin. Q: What should I pack for my child or myself while at Camp Bird? A: This list would be too long for this page, so we devoted an entire page just for this question. You can find it at the What to Bring page. Q: Where is Camp Bird located? A: The short answer is 16 miles west of Crivitz, WI, on Caldron Falls Rd. just off of highway W. More detailed information, including directions on how to get there, can be found in the Directions page. Q: What is Camp Bird's address? How should I address a letter to my child at Camp Bird? A: N8395 Caldron Falls Road, Crivitz, WI 54114. Mail early in the week. If your camper’s mail does not arrive by Thursday, it will likely be returned to sender. Please address any letters to your child’s name c/o Camp Bird N8395 Caldron Fall Rd. Crivitz, WI 54114. Q: Can my child request to be in a cabin with their friend? A: YES! There is a section on the registration form just for this. Please have both (or all) friends list each other on their forms. Unfortunately, we cannot guarantee that your child will be with their friend, but we do all we can to accommodate these requests. Camp asks that you keep this to no more than 2 or 3 friends as meeting new people is a great part of the Camp Bird experience! This is also a great reason to sign up early rather than right before camp starts, as cabins are assigned a few weeks in advance. Q: I have an URGENT message for my child at Camp Bird. How do I get that message to him/her? A: Call (715) 757-3241 and speak to the Director or his assistant. Q: My child left something behind at Camp Bird, how do I get it back? A: Please email campbirdforlutherans@gmail.com or call (920) 553-4800 and ask to speak to Pastor or Mrs. Stelter. Q: What is the daily Camp Schedule like? A: In short, the day begins with breakfast, which is followed by a singing class and bible study. There is a short free time and then it is time for lunch. After lunch there is the afternoon activity classes and then more free time. Supper comes next with a camp-wide game or activity after supper. 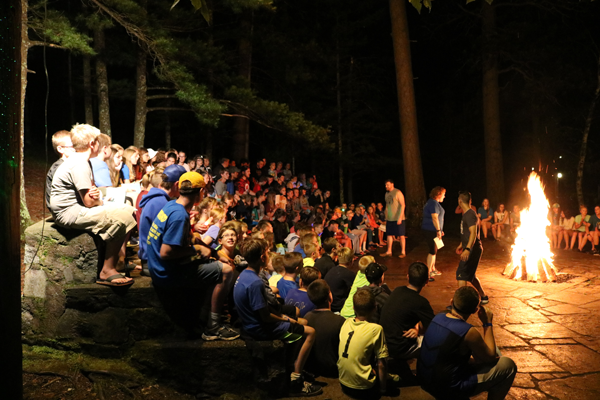 We close each day with a nightly campfire, singing songs and listening to devotion before lights out. Q: Are there Memories discs still available? Q: I noticed on the weather that there are severe storms near Camp Bird, should I try to warn Camp? A: Since our daily activities are influenced by the weather, we are very attentive to current weather conditions. All campers remain in their cabins or another place of safety during storms. Q: When is the earliest I can sign my child up for Camp? When is the latest I can sign my child up for camp? A: The earliest you can sign up for camp is as soon as we have the application form ready. This usually occurs during the winter months. Come back to the site and check the registration page often. If you would like to be emailed when the application is ready, please email Campbirdforlutherans@gmail.com. The latest a child can be signed up for Camp is the day Camp starts, IF THERE IS ROOM. It is advisable to verify that there is room at camp before doing this. Please email Campbirdforlutherans@gmail.com or call (715) 757-3241 and ask to speak to the director. Q: Can I pick my child up early on friday? A: The closing service is the culmination of a week’s worth of singing classes and an appropriate conclusion to a spiritually uplifting camp experience. We ask that your child stay through the closing service. Early departures must be approved by the Director. Q: I cannot get to Camp Bird in time to complete the registration on Sunday, What should I do? A: Please let Camp know. Call (715) 757-3241 and ask to speak to the Director. We will advise you further. Q: What if July just doesn't work for me? A: While we feel Camp Bird for Lutherans offers one of the best summer camp experiences available, we recognize that we are only holding the camp for 3 weeks out of the year. If you still want an excellent camp experience, we encourage you to look at Camp Phillip near Wautoma, WI. While our programs differ somewhat, Camp Phillip is also a rewarding and Christ-centered Lutheran camp.